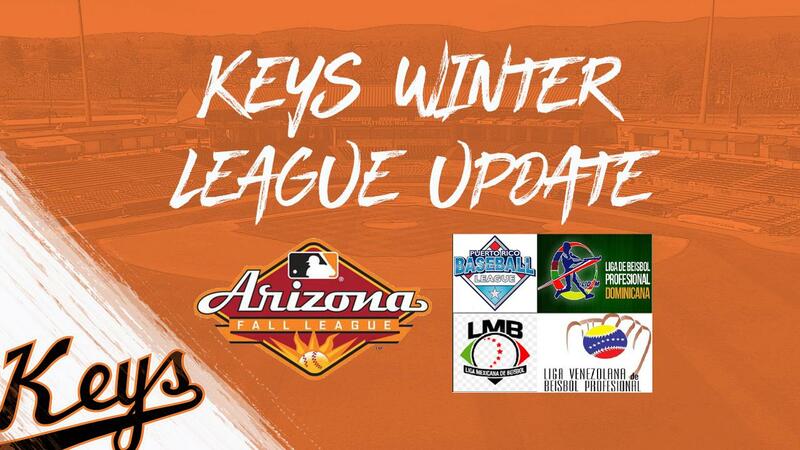 The 2018 Minor League Baseball season might be over, but plenty of former Frederick Keys are taking part in the Arizona Fall League and other winter leagues in Venezuela, Mexico and the Dominican Republic. Each week we will provide updates on these players as we begin the countdown to the 2019 season. This upcoming Saturday, the annual Arizona Fall League Fall Stars Game will take place. Although no Orioles prospects were initially selected for this all-star contest, Ryan McKenna is part of the Fall Stars Final 2 Vote. Fans can vote for McKenna for one of the final two spots in the Fall Stars Game by voting online. A link to the voting can be found here. Voting closes on Wednesday at 3 p.m ET and fans can vote up to five times. One of the AFL's top players, McKenna is slashing .366/.490/.610 to go with a 1.100 OPS for the Glendale Desert Dogs. Over 11 games, he is 15-for-41 at the plate with three triples, four doubles, five RBIs and 12 runs scored to go with one stolen base. Entering Tuesday's action, McKenna is tied for the league lead in doubles, is third in slugging percentage, fourth in on-base percentage and is tied for seventh in hitting. He is currently riding a seven-game hitting streak during which time he is batting .429 (12-for-28) with two triples, three doubles, five RBIs and eight runs scored. Outside of McKenna, former Key, Tanner Chleborad is 1-1 with a 2.25 ERA in six games for Glendale. Over eight innings, the South Dakota native has allowed two earned runs on 10 hits to go with three walks and seven strikeouts. A member of the Keys in 2016 and 2017, Chleborad went 6-1 with a 3.61 ERA in 43 relief appearances to go with 14 games finished. After being named a midseason all-star with the Keys, Tyler Erwin has tallied a 3.68 ERA in seven games, while Chris Lee's ERA sits at 2.19 through four starts. His most recent one on Monday was his best, as the left-hander tossed five shutout innings of one-hit baseball against Scottsdale. He is holding opponents to a .186 average, fifth-best among AFL starting pitchers. Aderlin Rodriguez has batted .375 (3-for-8) with a double and an RBI in his first five games for the Gigantes del Cibao. Spending the season with the Double-A Bowie Baysox, the ex-Keys first baseman tied for the organizational lead in home runs (23) along with Wilson Garcia , who spent this season in Frederick. Spending the 2018 campaign with the Diamondbacks, Jay Gonzalez is hitting .300 (15-for-50) with a double and nine runs scored in 14 games for the Caneros de los Mochis. Meanwhile, Dariel Alvarez is slashing .288/.339/.519 for the Charros de Jalisco to go with three home runs, a triple, a double and nine RBIs as well as nine runs scored. Alvarez transitioned to the mound this season with the Orioles, pitching twice for the GCL O's while coming back from injury. The Frederick Keys will host the Carolina League All-Star Game in 2019. Next season's schedule is available by clicking here, while fans can buy/renew ticket plans for the 2019 season by calling 301-815-9900. For more details about the 2019 season, fans can visit frederickkeys.com.